You are at:Home»Air Conditioner»Is it Normal for a 5 Year Old Air Conditioner to Leak? By Frank Alexander on	 February 1, 2016 Air Conditioner, Coil, Refrigerant Leak, Should you Repair or Replace? That is a very common question from homeowners. Many calls we get during the cooling season turns out the air conditioner is low on refrigerant. Think of it like this; has your refrigerator needed refrigerant every year? It probably has not. An air conditioner works using the same principles as your refrigerator. It should never need refrigerant added, unless there is a problem. To be more precise, no, it is not normal for a 5 year old air conditioner to leak refrigerant. Typically what has happened is that the coil, which is made up of straight tubes, fins, “U” connectors and various other refrigerant carrying pieces. These pieces are welded together at the factory and should remain leak proof for the life of the coil. However, the welds and pieces are most times made up of different metals that expand and contract differently when exposed to extreme temperature fluctuations. These welds sometimes start to fail or crack resulting in a refrigerant leak. There is also some long term deterioration that comes along with copper coils. Formic Acid, a byproduct of building materials, is released and is corrosive to copper. Over time it can etch away at the copper tubes and create microscopic leaks in the tubes themselves. There are some solutions out there that will temporarily fix the leaks, while others are longer lasting. Replacing the coil that is leaking should solve any coil leak, but it can be expensive. 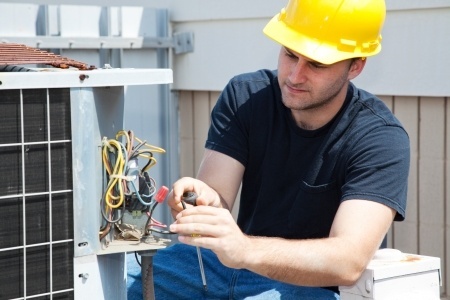 When a coil is replaced, the old refrigerant is recovered and taken away for proper disposal, and new refrigerant is put back into the air conditioner. The main reason the refrigerant cannot be reused is that it may now contain contaminates such as oxygen and water that will act like acids and eat away at your new coil causing it to have a shorter expected life. Another solution is to use a leak sealant. Some of the products out on the market are better than others, so ask your technician which one he uses and do your research. Sealants also have limitations as to what type of system for which they are better suited. Due to the actual pressure changes in the evaporator coils, heat pumps tend to have less positive results with leak sealants. It is better to just replace the coil with a heat pump.